As an alternative to a cervical fusion, cervical disc replacement involves the placement of an implant to preserve neck motion. This procedure commonly is used to treat cervical disc herniations, cervical spinal stenosis, cervical degenerative disc disease, and cervical radiculopathy. Cervical Disc Replacement (also known as Cervical Artificial Disc Replacement) is still relatively new to the U.S, having been first approved in 2007. 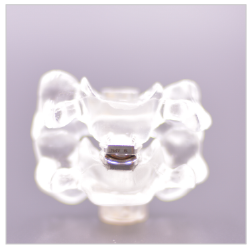 At present, there are several different implant designs of cervical artificial discs. Published outcomes have shown a very high success rate in alleviating radiating pain in the arm(s) and scores high in satisfaction for the appropriately selected patient in the short-term. Long term outcome data is not available. The hope with cervical disc replacement is that it will protect against, or at least minimize, the risk of developing degeneration above or below the level being operated on. This procedure can be performed on an outpatient basis for many patients. As with any surgical procedure, there are potential risks and benefits that should be discussed and considered. Once decompressed, the correct sized implant will be determined using specialized instrumentation. The implant will be then placed into the disc space and confirmed using live x-ray. The advantage of this approach is that it allows the surgeon direct access to the level of the disc and bone while only having to split a minimal amount of muscle. This helps limit post-operative pain. Also, since the goal of this surgery is to maintain natural motion, immobilization with a cervical collar is not necessary. For a one or two level procedure, this is expected to be an outpatient procedure. If your pain level is tolerable and you are doing well medically, you can expect to be discharged. For a one or two level procedure, you will leave the hospital or surgery center with a soft cervical collar. You may take this off when you wish. We encourage you to wear it for the first week, especially when outside the home. For a one or two level procedure, most patients can safely return to driving within 10-14 days after surgery. Please keep in mind that if you are taking narcotic pain medication and/or wearing a cervical collar, you should not drive a motor vehicle. Do I need to take antibiotics before I have any dental work performed? Yes. You should let your dentist be aware that you have a disc replacement and require antibiotics before you have a teeth cleaning or other dental work.